Yesterday I picked up a old Veiwlex negative projector. The last time I saw a negative projector was in a photojournalism class at the Art Institute of Pittsburgh. I took the class in early '98 as a Visual Communications major. I picked up this old soviet helmet in Kandahar. 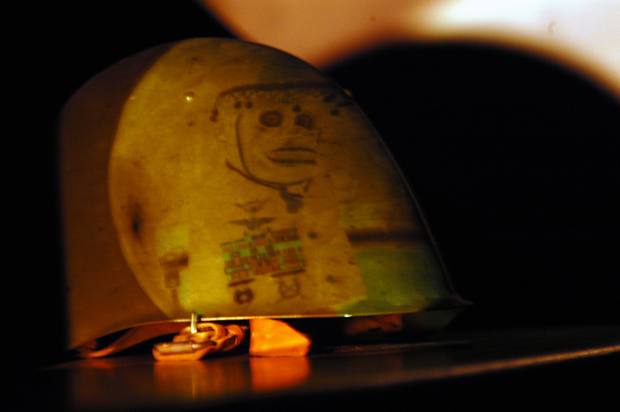 The negative is a pic I took of Marine Meduim Helicopter Squadron-263's Vietnam-era mascot, Ready Ape. His name comes from the crew chiefs' verbal verification to the pilot that the helicopter is ready to start. The crew chief would stand at the rear of the helo and shout to the pilot, "Ready APU (auxillary power unit)!"